I am sad because one of the happiest things on the internet has stolen something from me. Nom. 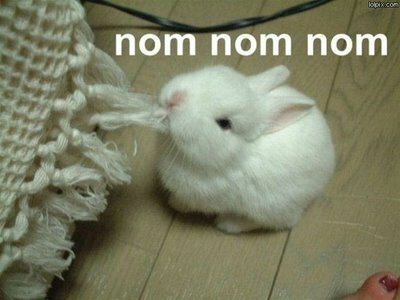 You’ve read it, seen it in cartoons and on posters of cute animals eating. 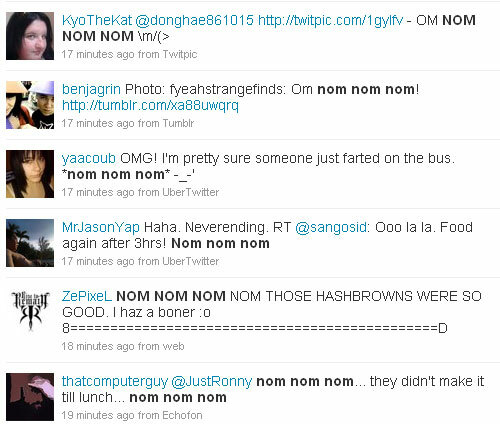 Usually it’s repeated a few times: nom nom nom nom. You can’t throw an everything bagel on Twitter without hitting it two or three times. But for years, Nom has meant something else to me and what seems like too few others. In Stephen R Donaldson’s book “The One Tree,” a creature called a sandgorgon is introduced. Sandgorgons are creatures of unending rage. They are built for destruction and are fueled by eons of frenzied anger. Trapped in mystic, desert prison, sandgorgons can only be released from their confinement if they are summoned by someone calling their name. Once summoned, they must kill the person who said their name. This is witnessed when a warrior character is forced to say the name of a sandgorgon and then is pummeled to death. Once the summoner is killed, the sandgorgon is pulled back into its prison. Later, in a move most tremendous, the main character who is stuck in a prison cell deep in the heart of a fortress, summons a sandgorgon with the name he heard earlier. The sandgorgon batters his way through the walls to confront the one who summoned him. A battle rages and our hero, using wild magic, is able to defeat the sandgorgon without killing him. The sandgorgon realizes that he is now free and bows to our hero with respect. This sandgorgon’s name is Nom. When the hero Thomas Covenant said that name, I got chills. It was so unexpected and brilliant. And now... it's been wasted. Nom nom nom. 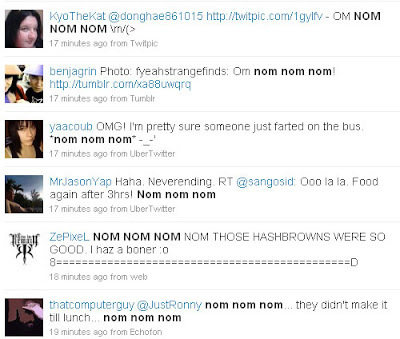 The only good feeling I get when seeing people say “nom nom nom” is thinking about them being pulverized to squishy muck by a raging creature that disappears back into the nothing once the deed is done. I agree, the moment where Covenant says 'Nom' is one of the strongest parts of the entire series. It's a climax of sorts. Donaldson has built the story beautifully to reach this point. I was thinking about the scene where he says that name and decided to google 'Covenant Nom' which brought me here. I also have a strong connection to that scene in the book... it was just jawdropping and amazing when I first read it... I was 13 I think haha. Now i'm 42 and it still haunts me. I have read many other epic fantasy series Goodkind/Jordan/Feist etc but none ever touched me the way Donaldson's did. Powerful stuff. AeroSquids comments could almost be mine....... Just thinking of that spine-tingling scene (which for me stands alongside Aragorn summoning the dead army in Lord of The Rings) and decided to Google 'Covenant Nom'. I'm 58 and the Thomas Covenant trilogies still rank highly among the many, many books I have read. I have to say I find Donaldson a bit self-indulgent at times, but nonetheless a brilliant storyteller. Couldn't get into the Gap series, though! Stephen King has a dog named Molly, the thing of evil. The dog has a toy named NOM. Nasty Old Monkey. This is odd, for I thought the reason why the name was summoned, was because a Bloodguard was imprisoned. And because he could not protect Thomas Covenent, this Bloodguard did what was necessary, to free himself. Mind you, I read this book, when it was first published, and I am most likely, mistaken. I guess I need to read it again!